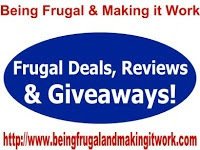 Being Frugal and Making It Work: Enter to Win Blog Giveaways - I Won 3 This Week! Did you win something exciting this week? Congratulations Bridget, I hope you'll win lots of great giveaways this week as well.